With school starting this week for us Australians (WHERE DID THE HOLIDAYS GO? ), I thought it would be fun to share with you tips on staying organised this year! Now, I know what you're thinking: Tyra, what makes you think you can tell us how to be organised? Well really, I don't exactly have a 'Degree in Organisation', but I do take pride in how I remain organised and up-to-date with school work. I also know how to balance school work, extra-curricular activities and blogging. Sooooooooooooo, here are some quick tips on how to be organised in 2015! My biggest organisational tool is my planner! I always say that my planner is my life. I always believe that writing things down in a diary not only makes it easier to plan my day, but it also helps me remember things! If writing thing down isn't your cup of tea then…. There are hundreds of apps that suit everyone's organisational needs. So, if you have an tablet, phone, PC or laptop, then here are a few apps that I personally love! (However, there are so many, so feel free to search for some on your own). You're able to write down everything that is happening on a specific day like you're using a planner, and then you can also add assignments, specific classes & instructors. 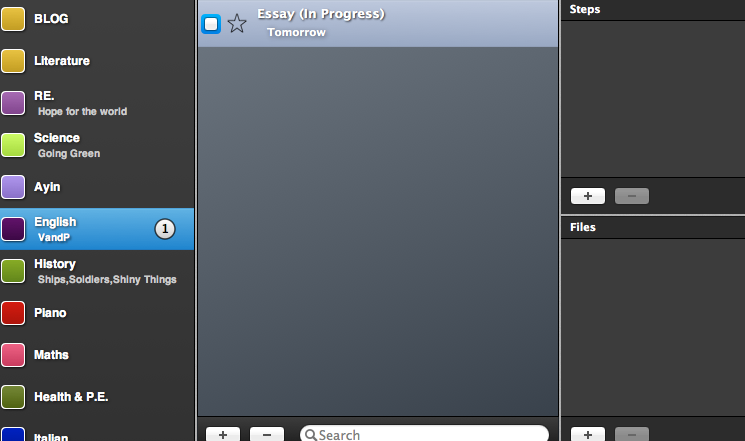 Very much like iStudiez however it is purely an app to remind you about upcoming homework, tests and assignments. You can colour code, choose different priority levels for the reminders and even add attachments and have a step-by-step plan for your homework! 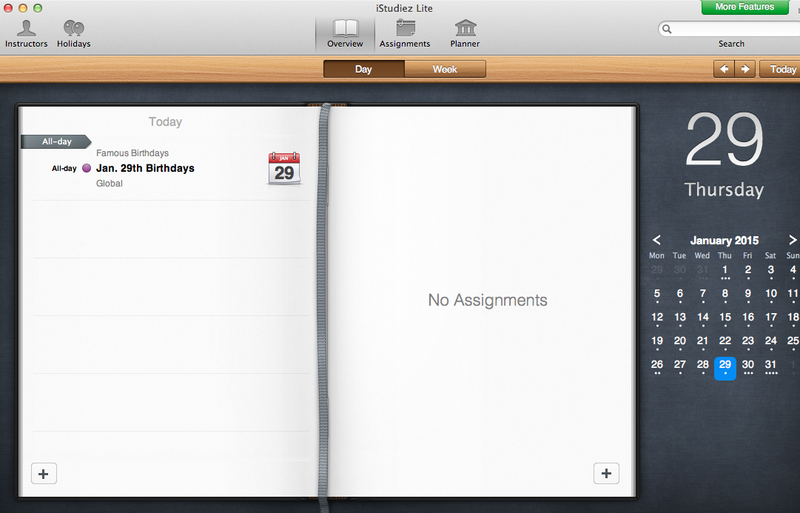 Who can not like iCal? 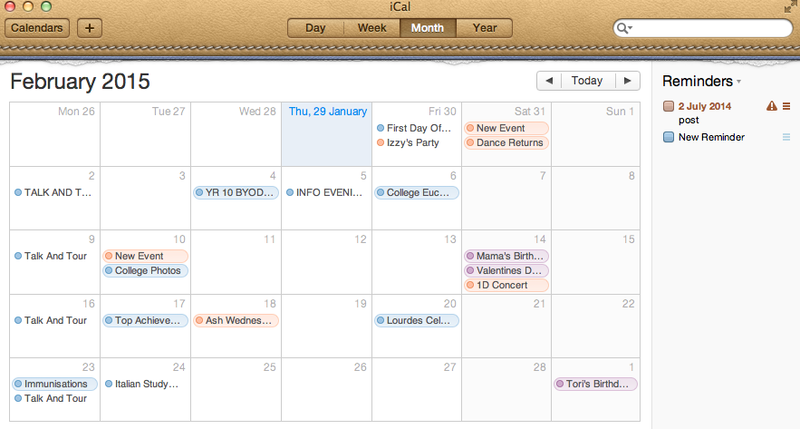 iCal is obviously a normal calendar, where you can add your subjects, homework and more important dates! Also, you can add reminders, so you can be alerted when something is due! 3. As Soon As You Get Homework, Do It As Soon As You Can! Don't leave things to the last minute, it will just add unwanted stress in your life! As soon as you get an assignment, try and start it straightaway1 I'm not telling you to finish it in one night, that means you won't do it to the best of your ability. All I'm telling you to do is try and start it as soon as possible! What I know is, there is always one week every term where all the assignments are due that week, and there are two tests every day! So, it is better to do as much as you can before the 'busy time' of the year, because that will just lead to you forgetting to do homework! -Tidy -- Avoid clutter, you will just lose important things! -Organised -- How? Use sticky notes, a inboard with revision sheets and notices pinned on it, or a whiteboards where all your upcoming homework is written. You need to splurge a little on organisational supplies. Use a mug to put all your pens in or have a memo box sitting by your books so you can write down little reminders! -Personalised -- MAKE IT YOURS! Have a photo of your friends sitting on your desk, or have incense in the room! Do anything to make your spot perfect for YOU! I HOPE YOU LIKE THESE TIPS! Leave me a comment below telling me about your organisational tips, or whether or not I helped you! Thanks for reading this, and good luck to everyone starting school this week!